Recognize clear or subtle and implied relationships among ideas (e.g., cause-effect, comparative, sequential) in complex informational texts. Compare/Contrast Online Activities - These activities help students read and write using compare and contrast. A good place to start would be "Help Lee Decide." After that, try "What Should Maria Do?" Summarize in a concise and well-organized way the main ideas, supporting details, and relationships among ideas in complex informational and technical texts. 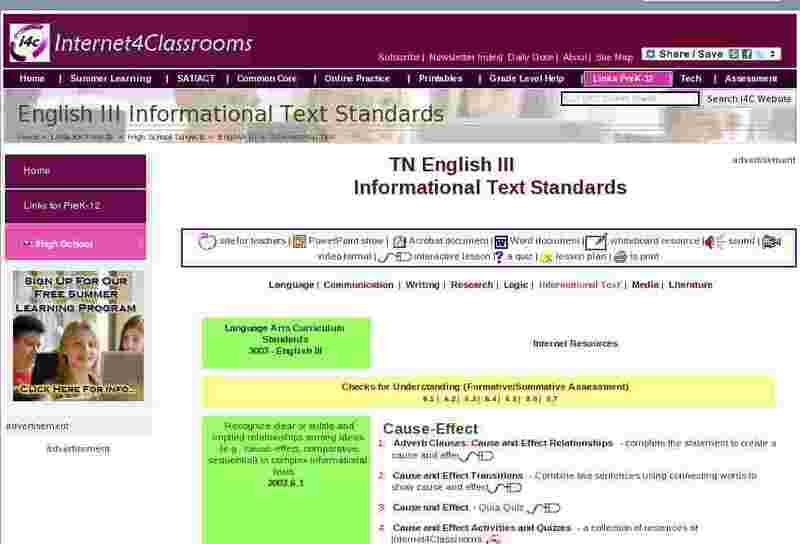 Synthesize information across multiple complex informational and technical texts. Evaluate the ways in which a complex text�s unconventional organizational structure supports or confounds its meaning. Comprehend and evaluate complex information presented graphically. Evaluate complex informational and technical texts for their clarity, simplicity, and coherence and for the appropriateness of their graphics and visual appeal. Follow extended multi-tasked or multi-dimensional instructions in complex informational or technical texts. Analyze information presented graphically in a complex informational or technical passage. Select the clearest, most concise summary of a complex informational passage. Identify the organizational pattern of an informational or technical text.